Aid agencies are giving out food relief in Uganda’s arid northeastern Karamoja region earlier than usual due to greater food insecurity, which locals and experts blame on the failures of a key government food security plan launched five years ago. The UN food agency, WFP, is providing targeted relief to 155,000 people from the most food insecure households in all seven districts of Karamoja, assisting 377,000 people through an asset-creation programme and 100,000 children through school meals. In addition, 40,000 women and children receive food under the mother-and-child health and nutrition programme, and 26,000 malnourished children monthly under the community-based supplementary feeding programme. “WFP began food distributions among the most vulnerable households earlier than usual, in February. WFP is providing assistance through programmes that reinforce each other in addressing food and nutrition security in Karamoja,” Alice Martin-Dairoun, the WFP country representative, told IRIN. The lean season normally lasts from April to September. According to the August rapid crop and food security assessment conducted by the Ministry of Agriculture, Animal Industry and Fisheries, WFP and the UN Food and Agricultural Organization (FAO), an estimated 103,000 people faced severe food insecurity and 248,000 are under stress as a result of a long dry spell across the region. The report predicted that the food security situation would worsen during the peak of the lean season this year and 495,000-600,000 people will need assistance. Locals and experts have attributed the chronic food shortages, malnutrition and poverty in the region to the failure of the government five-year US$35 million Karamoja Action Plan for Food Security (KAPFS, 2009-2014) which prioritized crop farming over traditional pastoralism (livestock), which people have survived on for decades. The plan was officially launched in March 2010 to ensure sustainable food security and increased household income in Karamoja, but hundreds of households out of an estimated 1.2 million population in the region continue to suffer chronic food shortages and rely on relief handouts. “These plans are politically driven, not systematic, and focus more on quick fixes to the food security situation without considering the weather patterns and the change in climate and other factors,” he added. “Instead of supporting what people have lived on and been doing for years and honed skills in the process that would only need improvement, say in disease control, animal husbandry, marketing and conflict management, the government is ideologically disoriented and hell bent on promoting crop agriculture in semi-arid areas where drought comes every 3-5 years,” he said. He noted that other sectors, such as crop agriculture, mining, tourism and the service industry should supplement, not replace livestock. According to the 2008 national livestock census, Karamoja has 19.8 percent of all cattle in Uganda, 49.4 percent of the sheep, 16.3 percent of all goats and 90 percent of donkeys. “It’s better to strategically support what people are doing now and build on it than introduce unsustainable options without adequate funding. With little money available, livestock is better because they can survive on such patchy resources, scattered grass, rain and water,” added Kanyangareng. Misappropriation of the money for the programme is also impeding its success. “Karamoja will be chronically food insecure. The funds meant for this plan were mismanaged and embezzled due to corruption tendencies. There are no actual programmes on the ground to address the food security situation,” said a government official, who wished to remain unnamed. A January 2014 food and nutrition assessment commissioned by WFP and the UN Children’s Fund (UNICEF) found that at least half of the households in Napak, Kotido and Moroto districts were experiencing food insecurity as a result of the poor harvest in 2013. The study conducted by Makerere University School of Public Health showed that household food stocks in the three districts were not expected to last even a month. The same survey found levels of global acute malnutrition at 11 percent on average in the whole of Karamoja, which is above the internationally recognized alert threshold of 10 percent. “The plan was championed by experts who didn’t involve the local people to secure their acceptance. The plan was imposed on them and as a result it failed to achieve its intended purpose. The experts should have consulted the local community to identify their problems and suggest solutions for addressing the food insecurity in Karamoja,” John Emong, a social worker in the area, told IRIN. “With guide from community workers, let Ngikaramojong [people] identify their real concerns, wants, needs and solutions thought,” he said. Musa Ecweru, Uganda’s state minister for relief, disaster preparedness and refugees, defended the plan, saying it has continued to improve food security in Karamoja and wean it from dependency on food aid, despite the harsh weather conditions. “The relief supplies to Karamoja have reduced tremendously over the years because of this strategy [KAPFS]. We no longer deliver huge relief to the region as it used to be. The people have been able to grow their food and had bumper harvests in good seasons,” Ecweru, told IRIN. “However, there has been crop failure in the last three consecutive years due to hostile weather. The region continues to experience bad weather conditions like prolonged drought, erratic rains and floods,” he said. Although Karamoja sub-region has one of the most fertile soils in Uganda, it has only one rainy season a year, and failing rains have serious food security implications. “Karamoja has experienced an increase in natural disasters, reflecting in part the impact of climate change. This has undermined the livelihoods of the agro-pastoral populations in this semi-arid region,” say the authors of the Karamoja Integrated Development Plan. “Severe droughts have decreased household crop production, while also diminishing the pasture available for livestock. Unless urgent intervention is done, there is a danger that the process could precipitate a more intense conflict, leading to displacements and compounding any food-insecurity crises arising from natural disasters,” says the plan. “The government is putting more concerted interventions like construction of valley dams, water tanks and micro-irrigation schemes to address the water problem in the region,” Ecweru told IRIN. 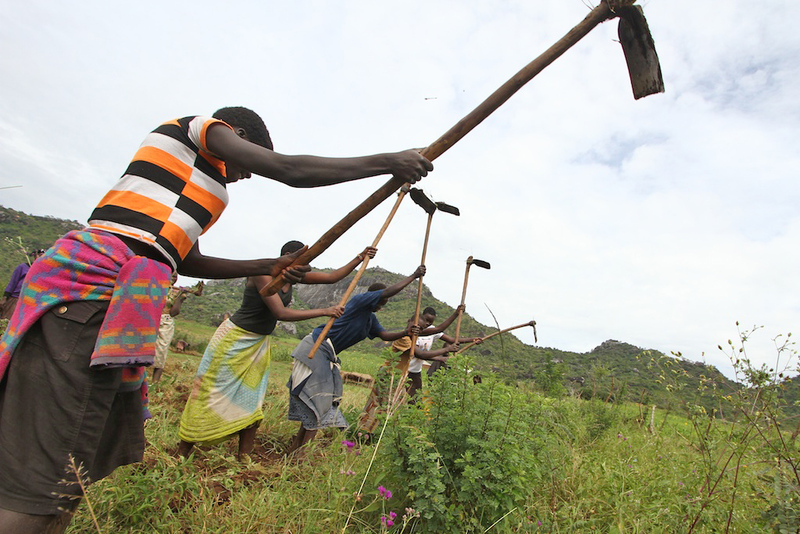 Towards the end of last year, the government planned to introduce a mandatory gardening scheme to improve food security in Karamoja, but experts and residents described it as short-sighted and patronizing. But legislators from the Greater North Parliamentary Forum visited all seven affected districts in February, seeking local views to come up with policy strategies to improve conditions in the region. “There is need for recognition of pastoralism as a viable livelihood option that can thrive in Karamoja which should be respected and accepted by all partners and government through planning, [rather] than programmes that undermine pastoralism and push people into agriculture,” says Dan Church Aid’s Toolit.